A prolific designer of furniture and home products, Patricia Urquiola was recently named Art Director of the venerable Italian brand Cassina. Explore some of her myriad pieces in these nine modern dwellings! This coastal home designed by Australian architect John Wardle is uniquely tuned in to its residents and to its epic surroundings. 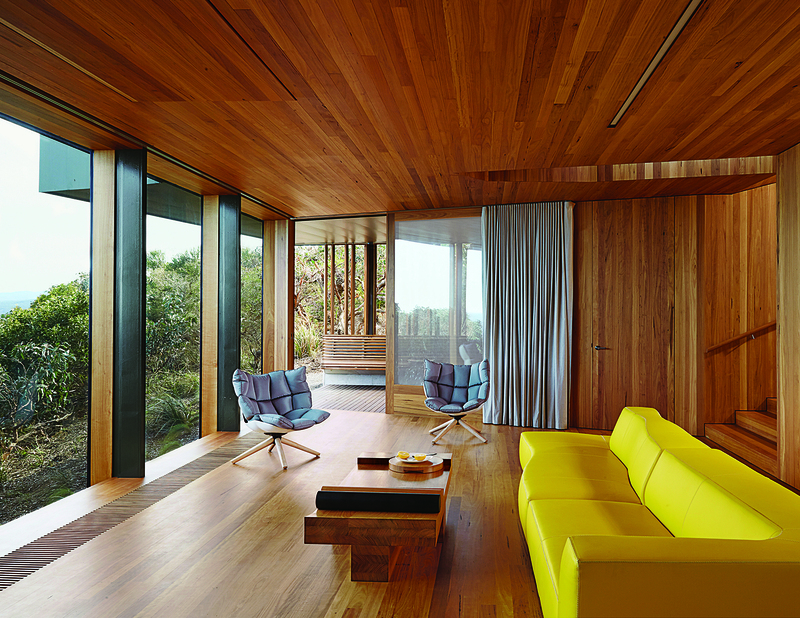 Refusing to fixate on the seascape at the expense of other views, Wardle oriented the living room to a lush grove of trees. A yellow Bend sofa and two Husk chairs, both by Patricia Urquiola for B&B Italia, add splashes of color. Two designers restored this low-slung midcentury gem in Napa, California, by an unsung Bay Area modernist. In the bedroom, a Margaret Kilgallen print joins a Brionvega Algol television, lamps from Patricia Urquiola and Pablo, and a Hans Wegner chair. Although postwar California modernism is generally associated with Southern California, the Bay Area’s own tradition has begun in recent years to be more widely acknowledged, and its surviving treasures have gained an appreciative audience. San Francisco’s modernists were faced with the issue of building within a firmly established stylistic tradition—think bay windows and gingerbread. Henry Hill’s 1947 renovation of a 1908 Victorian tucked away on an alley in historic Russian Hill provides a remarkable response to the dilemma. In 2005, Gretchen Rice and Kevin Farnham acquired the unique home. Atlas shelving provides the framework for Farnham’s entertainment center. Almost 100 square feet of Patricia Urquiola’s Tufty-Time sofa for B&B Italia provides ample space to stretch out. Globetrotting Belgian architect Julien De Smedt carved out a space to call his own in this converted industrial loft building in Brussels. The living room includes a “plain old” beanbag, an Other One armchair by Leif Jørgensen for Hay, with a pillow by Candice Enderlé for Cojinudo, and two Tropicalia lounges by Patricia Urquiola for Moroso. On a wedge-shaped lot in the Texas Hill Country, a couple adapted this modular system to create an idyllic gathering spot. The living area is furnished with a Fjord swivel arm chair by Patricia Urquiola for Moroso and a Como sectional chaise by Giorgio Soressi. This family home on Australia’s Mornington Peninsula is built to blend in with its lakeside setting. The residents worked on the interiors with project architect Maria Danos. In the living room, an Arco lamp by Flos arches over a Jean-Marie Massaud for Poltrona Frau sofa, which joins an Antonio Citterio for B&B Italia coffee table, a Patricia Urquiola rug, and three-legged stools by Chris Connell. Six stories high, crowned with a pool, and with a direct lineage back to the Bauhaus, this new town house in Tel Aviv manages to both embrace and provide refuge from the teeming Israeli city. The living room features stunning views of the city, a Bend sofa and Phoenix coffee tables, both by Patricia Urquiola for B&B Italia and Moroso, respectively, and two Gray armchairs by Piero Lissoni for Living Divani. This apartment overlooking the High Line in New York City captures views of a constantly changing urban landscape. In a corner of the living room, a large work by Martin Mull and a pair of paintings by John Meyer join Moroso furnishings: a Misfits sofa by Ron Arad, a pair of white Nanook tables by Philippe Bestenheider, and Fjord tables by Patricia Urquiola covered in antique kimono fabric. A pair of architects help a client carve out this oasis of calm amid São Paulo’s bustle. The living room is furnished with a cherry-red Rest sofa and ottoman by Muuto, a Nest footstool by Foersom & Hjort-Lorenzen for Cane-Line, and a Redondo armchair by Patricia Urquiola for Moroso. A Kast modular storage unit by Maarten Van Severen for Vitra sits under the television.